My hair. It drives me nuts. 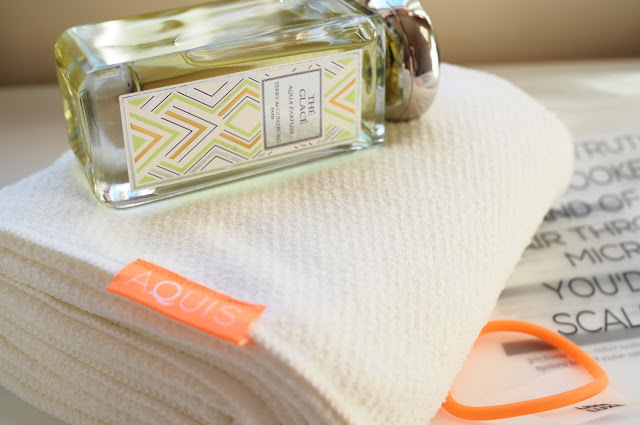 You know this, I’ve written about it endlessly over the years, and after recently buying it a hat to keep it quiet during the night, I thought it was time to treat it to a new towel too, so I got in touch with the lovely people at Aquis and begged them to let me trial their new, and rather lovely, Lisse Luxe Hair Towels. Luckily for me, they said yes, and now I’m the extremely happy owner of one of their long hair towels. 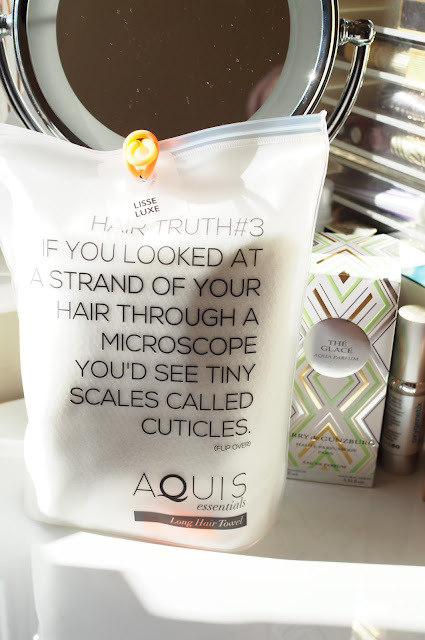 Now, those of you with long memories will remember that I bought my hair a special towel last year too, one specifically designed to encourage curls which is deliberately not that absorbent, but the Aquis Liss Luxe is designed to dry your hair super-quickly without damage. Also, to dry it superquickly without being made of those nasty really cheap microfibres, which, if you’re anything like me, set your teeth on edge and just have that “squeaky” feel against skin. I have a few (cheap) microfibre turbans, but they are just so horrible to the touch that I can’t bring myself to use them. 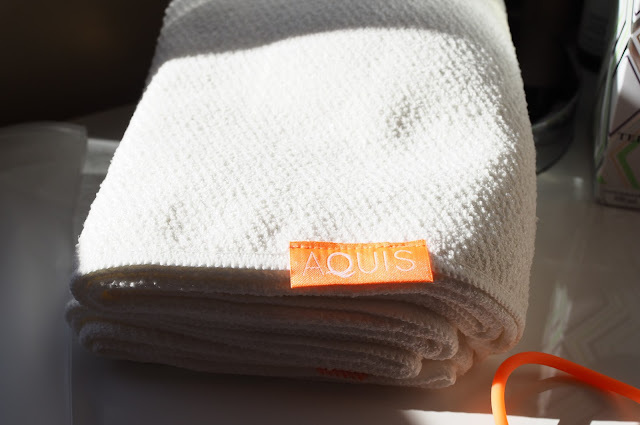 Made of a blend of polyester and nylon called Aquitex, Aquis towels are super light (literally a few grammes, even in the larger sizes, rather than a pound or two for terry-towelling) and actually feel wonderfully luxurious to the fingers. They’re slightly textured without that horrific squeaky microfibre feel. They’re amazingly aborbent for such a light towel, too. 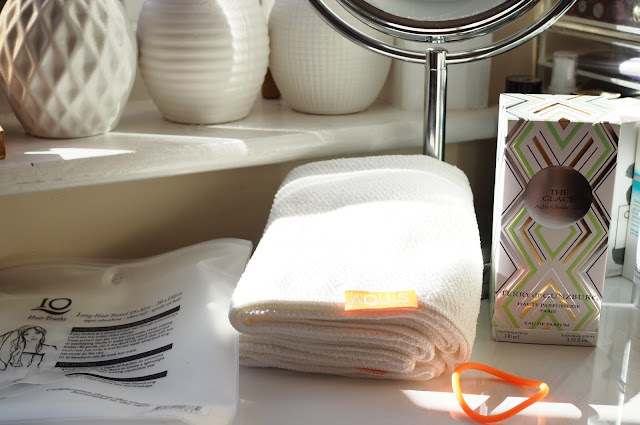 I have a lot (and I do mean a LOT) of hair, and it takes hours and hours to dry naturally even after an hour or two wrapped in a normal towel usually, but I’ve found that the Aquis Lisse Luxe towel can cut that drying time at least in half, if not more. In fact, after around half an hour in the towel last time I used it, my hair felt more than halfway dry already, just about perfect to start heat styling. If I could ever be bothered blowdrying, that is, which I can’t, usually. Unlike my curl-towel, which at £19 I thought was expensive for a clearly cut by hand with scissors and unhemmed piece of stretchy cloth (even though it does a sterling job, frankly), my Aquis Lisse Luxe towel at £30 seems priced correctly, even though it is on the pricey side. The quality of the cloth, the finishing details of an envelope to keep it in when dry (it even comes with a pony tail band! ), and best of all, the time saved from not having to use a hair dryer to rough-dry before styling all make me happy. And no squeaky microfibre! The website for Aquis claims that using the towel after every wash for three weeks will improve the health of your hair – I’m still a little sceptical about that, but then I never ever rub my hair with any kind of towel anyway, my hair just doesn’t need that kind of help creating frizz, frankly. However, for drying my hair gently, but quickly, and without having to carry around several pounds of heavy terry-towelling on my head for a couple of hours, it’s already definitely a winner in my book. Any improvements to the health of my hair will just be the cherry on the cake, frankly. You can buy the Aquis Lisse Luxe Long Hair Towel here for £30.